Herausgegeben von Duhé, Sandra C.
From Web sites to wikis, from podcasts to blogs, Internet-based communication technologies are changing the way today's public relations campaigns are conceived and carried out. 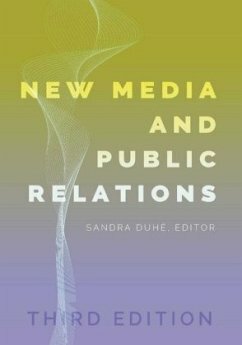 New Media and Public Relations charts this exciting new territory with real-life case studies that explore some of the ways new media practices challenge and expand conventional thinking in public relations. This comprehensive new volume charts the leading edge of public relations research, drawing on insights from both scholars and practitioners to question outdated models, discuss emerging trends, and provide numerous examples of how organizations navigate the uncertainties of building mediated relationships. Global in scope and exploratory in nature, New Media and Public Relations is an indispensable reference for contemporary research and practice in the field, and essential reading for undergraduate and graduate students in public relations and mediated communication. The Editor: Sandra C. Duhé is Assistant Professor and Coordinator of the Public Relations Program at the University of Louisiana (UL) at Lafayette and Associate Director of Communication at the UL Center for Business & Information Technologies. Prior to joining academia in 2004, she was a public affairs manager for three multinational corporations with extensive experience in media relations, corporate brand management, crisis response, risk communication, and community coalition building. She holds master's degrees in public relations and applied economics, and received her Ph.D. in political economy from the University of Texas at Dallas.